Poor Kit Harington. He’s probably sick and tired of asking the endless questions about Game of Thrones, the new season, Jon Snow and most importantly that fateful scene from the end of the last episode. Luckily though, when he made his recent appearance on The Jonathan Ross Show, the chatty host couldn’t resist it and had to corner him about the cliffhanger question on everyone’s lips. 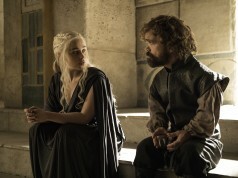 Although Kit’s name doesn’t appear in the official list of returning cast members – which features Peter Dinklage (Tyrion Lannister), Nikolaj Coster-Waldau (Jaime Lannister), Lena Headey (Cersei Lannister), Emilia Clarke (Daenerys Targaryen), Aidan Gillen (Petyr “Littlefinger” Baelish), Diana Rigg (Lady Olenna Tyrell), Sophie Turner (Sansa Stark), Maisie Williams (Arya Stark) and Jonathan Pryce (the High Sparrow) – it hasn’t stopped fan speculation on his character’s possible return. 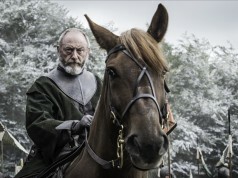 Season 6 Synopsis: Following the shocking developments at the conclusion of season five, including Jon Snow’s bloody fate at the hands of Castle Black mutineers, Daenerys’ near-demise at the fighting pits of Meereen, and Cersei’s public humiliation in the streets of King’s Landing, survivors from all parts of Westeros and Essos regroup to press forward, inexorably, towards their uncertain individual fates. Familiar faces will forge new alliances to bolster their strategic chances at survival, while new characters will emerge to challenge the balance of power in the east, west, north and south.